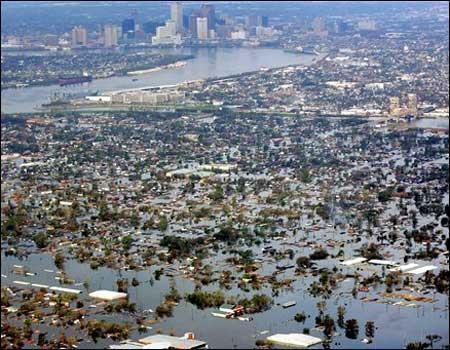 It is becoming clearer each day that Hurricane Katrina has become a disaster of Biblical proportions. I am saddened by the degree and scope of the loss in that region of our great country. I cannot even begin to imagine what so many are going through in the Gulf Coast. My prayers are extended to those who are suffering at this time and those leaders who have a tough road ahead, in guiding the efforts to restore order where lawlessness reigns and rebuild a shattered region. I am saddened that so many have so quickly politicized this catastrophe. I knew that Conservatives and particularly the Bush administration would be blamed for what happened, but I did not think that the blame would come so fast. I have read two articles that place almost all of the blame on the President and his policies. First it was Robert Kennedy Jr, who blamed Haley Barbour and the Bush administration for rejecting the Kyoto treaty. It is thoroughly absurd to believe that the Kyoto Treaty, if enacted would have stopped global warming (if global warming is even happening). Most studies of the Kyoto protocols have stated that if enacted in full it would still have a negligible effect in reducing greenhouse gases and thus reverse global warming. Next I read Sydney Blumenthal directly blame the Bush Administration for this catastrophe because he did not protect wetlands. According to his article, had wetlands been protected around New Orleans, that it could have reduced the flood surge by a foot. 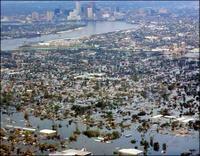 According to news reports the flood surge in the gulf coast was as much as 9 feet. So lets say that Blumenthals assertions are completely accurate and that the flood surge would have been reduced by a foot. It is doubtful that this would have made any difference. It is still a flood surge of 8 feet, and probably would have caused the levees to give way anyway. But we should not take either of what these two say at their words. There is still no consensus that global warming is even happening. There are many who question the science of those who believe in global warming. There are also scientists who say that it is happening, but do not blame mankind but rather say that it is a natural phenomenon, and that mankind cannot stop it. And some say that we have been in a warming trend for thousands of years. Remember the Ice Age. If it wasn't for global warming, the planet would still be a very cold place to live indeed. Regardless of these debates, it is disgusting that some have decided to exploit this catastrophe for political purposes. One may argue that Bush did the same thing following 9/11, but I say that he did what he felt was right to make America safe again. Those who have politicized this event should be ashamed of themselves. This is a natural disaster. It is not a terrorist attack that could have been prevented, had America not been asleep at the wheel. This is not a time to criticize, but rather a time to get behind our leaders and support them. It is time for us as Americans to pitch in any way we can. America rallied around New York and Washington after 9/11, and we must do it again in the wake of Katrina. It is time for us to mourn the dead, assess the damage, and begin to rebuild. It is time again for us to ask the Almighty for help in this tremendous time of need. It is time once again for the world to see the greatness and resilience of the American people. We will overcome this. We are all Americans, and we must stick together in this time of crisis and not allow ourselves to be pulled apart by politicos who would use this tragedy to advance their own agendas. Let us unite again and help restore what has been lost in our country.